The ever increasingly popular AR15 rifle. 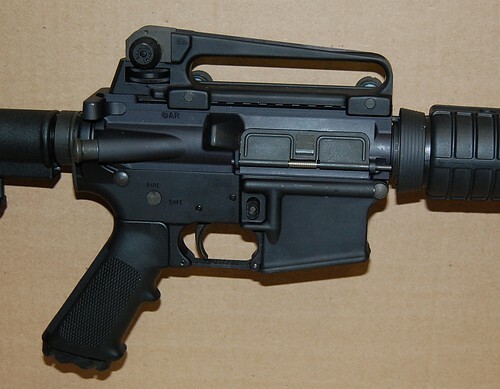 Mistakenly, many people associate the AR in the referenced image above as “Assault Rifle”. Which is incorrect as it stands for the originating company of the design, Armalite. The AR-15 is the Armalite, model 15, a gas impingement operated semi-automatic rifle. Usually chambered in or 5.56x45mm or .223 Remington, the AR-15 and its more military based brethren, the M16/M4, is utilized across the globe by armed forces and civilians alike. In fact in the USA it has become one of the most popular hunting rifles ever produced. Modular and with such a huge following, the AR-15 is the test bench for almost ANY conversion kit, optics, stocks, and aesthetic modifications created by manufacturers and hobbyists in North America.Samson Manufacturing has been producing reputable forearm guards and other machine components for various platforms for several years and in 2009 decided to come branch out into the market. What is being reviewed by TPF is the result of several years of development and in fact, at the first SHOT Show (2009) where this product was introduced, TPF was not allowed to take any images of it. Fast forward another year and TPF obtained a production version of this new tool. Now before any tool details are written about, there was one driving factor with this products design. The tool MUST stay with the gun. However with the huge plethora of aftermarket accessories and such, the question was where and how to attach this tool to the AR platform with minimal protrusions and attachments to the firearm itself. There was a single spot that met this requirement and minimized the space claim by such a tool. The grip. With this in mind and now a set space claim to work in, Samson Manufacturing began the design and subsequent production of the Field Survivor. 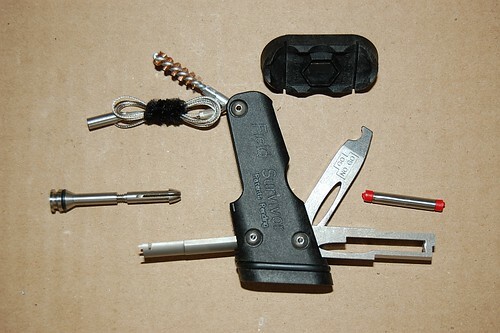 This tool was design to be unobtrusive when stored, and extremely helpful with some of the most common maintenance tasks associated with the AR-15/M16/M4 platform. What is very interesting is the sheer number of tools and features which the Field Survivor tool incorporates into its design. nearly every surface, part and bit of this tool is usable for some sort of measurement, adjustment, action to help maintain your AR platform. 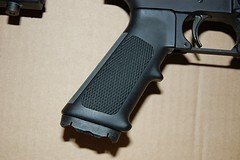 The FS-001 being reviewed by TPF fits standard A2 grips and Hogue AR15 Rev B grips. The Field Survivor, which is to be referred to as FS hereafter, has two main components. The end cap and the main body. The end cap is the scalloped portion which is visible when installed into the storage position in the grip. Affixed with a #8-32 stud, spinning the end cap either compresses the retaining o-ring, which expands outwards and creates a secure clamp inside the grip. By spinning the end cap in the opposite direction, the o-ring is relaxed and allows the tool to slide easily from the grip. The FS has a total of four (4) tool arms and a few removable components stored with the tool. Here is a basic rundown on the features and components of the FS for the AR15/M4/M16 family of firearms. TPF will start with the removable component parts first and work around the tool to document all the features of this tool. End Cap: Besides retaining the FS in the grip the end cap has several extra features. With scalloped edges the end cap functions as an impact device when the FS is properly stored in the grip of the firearm. A built-in 1/2″ hex pattern allows for the tightening of some nuts on several accessory and scope mount devices. There are provisions for securing two firing pin retaining cotter pins. The two straight slots are for use on metallic magazine feed lips for modifying their shape. 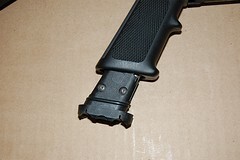 The #8-32 stud allows for some Otis products to be attached but is meant to be used in conjunction with the included cleaning cable for swabbing the barrel. Broken Shell Extractor: Included with the FS is a broken shell extractor. This extractor has two additional functions in addition to the obvious one. 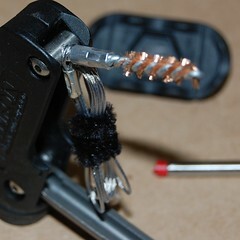 Used in conjunction with the pull cable (see next tool component/feature), the shell extractor doubles as a handle for pulling a bore brush through the barrel of the firearm. Almost as after thought, a spare extractor pin can be stored inside the cavity of the 2 piece broken shell extractor. Detachable Pull Cable: Normally stored within the tool body, this 23″ long steel cable has a loop on one end and a female #8-32 end on the other. The threaded end is for attaching and pulling bore brushes through the barrel, whereas the loop side is for running patches through the barrel. Lube Ampule: Included in the field survivor is a small metal ampule (container) which has plastic tapered plugs on either end. It is designed to hold a small amount of lubricant to allow for a single application of lube to essential components. Sight Adjustment Arm: This sectioned cylindrical tool has 3 prongs which correspond to an A2 front sight for adjustment. 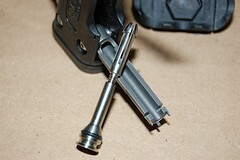 the arm also includes a small straight cutout for fine metallic magazine feed lip adjustments. The secondary purpose of this arm is to store the broken shell extractor when within the grip of the rifle. The Otis Attachment Arm: This arm is literally a pivot with an #8-32 thread in it to mount the bore brush. Other attachments can be inserted into this spot, but doing such may make grip storage impossible due to space constraints. The Hook/Screwdriver Arm: An interesting multiple usage arm, which has a very robust thickness and apparent strength is home to a short straight screwdriver blade and a small hook like feature which can be used to remove firing pin cotter pins from the bolt carrier group. The interesting feature however is the width and machined strip along the edges of this tool arm with crate a Go/No Go gauge for metallic magazines and allow for instant field checking of suspect magazines. The Scraper Arm: Another hefty arm, this scraper has edges along both long sides and opposing scrapers on the tip, in fact it reminded the author of cutters used on milling machines. Sharp and made of steel, care needs to be followed when used on the aluminum alloy of the AR15/M4/M16 platform. This arm also houses the lube ampule very securely as it forces the ampule’s plugs to seal via mechanical tension. The FS Body: How is this even a tool after all the other components and functions may come across the minds of many. The profile of the body, on the side which mounts the sight tool, shows the proper curvature of feed lips for metallic magazines and a small line shows a very basic “No-Go” limit with a small line show on the curve. The Field Survivor is compact and masses approximately 100 grams (3.5oz). No sleeve or sheath is offered as the tool itself is designed specifically for installation to a firearms’ grip. The FS-001 reviewed, and all AR platform versions are dedicated for 5.56mm/.223 chambers as that it the primary calibre for the rifle. There are also 3 other variations of the Field Survivor available and all have slightly differing components and features which are specific to their associated rifle platforms. The FS-002 functions in Magpul MAID/MOE grips, but is otherwise similar to the reviewed FS-001. The FS-003 is made specifically for the AK-47 and as such will most likely not see much demand in Canada. The final version currently available is the FS-004, which caters to STAG/CMMG piston driven AR platforms and sacrifices the scraper arm for a gas piston wrench. 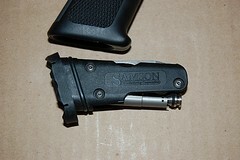 The family of Samson Field survivors are available for purchase from such places as DS Tactical in British Columbia. The FS-001 as reviewed by TPF retails for $156.99 CDN. Samson Manufacturing Corporation’s Field Survivor (FS-001)? Is it Tactical, Practical or Fantastical? This entry was posted on July 29, 2011 by M. Duynhoven. It was filed under Blades and tools, Firearms accessories and was tagged with AR-15, Field Survivor, Samson, Samson Mfg., Store in grip. If you are a member of CanadianGunNutz.com, make sure to tell the guys at DSTactical and your handle on CGN, and you will receive a 10% discount! Help support our Canadian firearms industry!